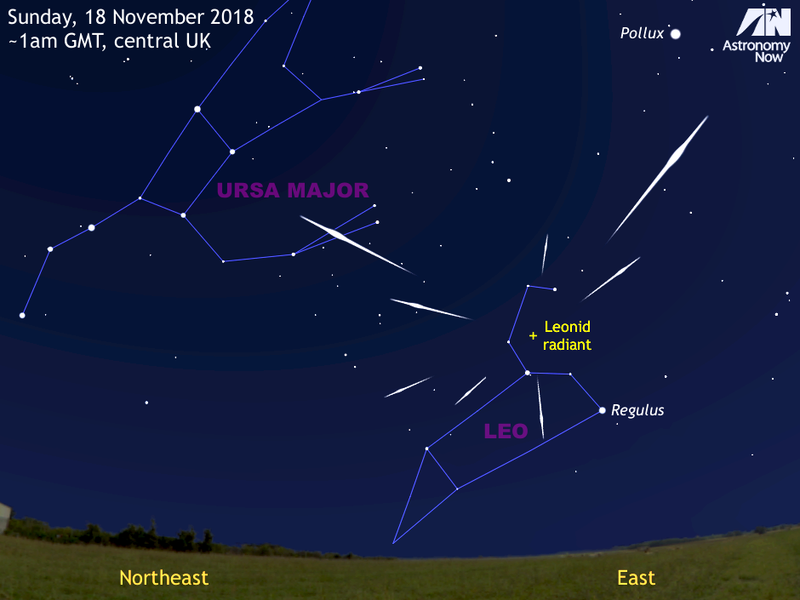 Astronomy Now - See the Leonid meteor shower peak on 18 November | Astro What? The best prospects for observing a meteor from the Leonid shower occur around the maximum, which is predicted to arrive around 1am GMT on Sunday, 18 November 2018. However, the meteor radiant (the region of sky from which they appear to originate) does not rise until after 10pm local time. The 9-day-old waxing gibbous Moon sets about 1am GMT in the UK, so prospects are good. Find a safe place as far removed from light pollution as you can soon around midnight that offers a clear view of the eastern sky, directing your gaze halfway from horizon to overhead. Around 10 swift shooting stars per hour are expected. AN graphic by Ade Ashford. The annual Leonid meteor shower results from debris strewn along the orbit of Comet 55P/Tempel-Tuttle, particles that the Earth encounters from 6 to 30 November. These particles are travelling at close to 44 miles per sec (~250,000 kilometres per hour), so they burn up due to friction with air molecules in our atmosphere some 50 miles (80 kilometres) above the ground, leaving a brief incandescent trail – a shooting star. The Leonid shower is well known for these fast meteors, the brightest of which can leave persistent trains that appear to hang in the air for several seconds. Particularly bright shooting stars are known as fireball or bolides, created by cometary debris that might initially have been the size of a grape. Discovered in December 1865, Comet 55P/Tempel-Tuttle has an orbital period of 33 years and the number of meteoroids it spawns (and hence the number of shooting stars seen) grows in intensity when the comet is near perihelion. Sadly, 55P will not return to the inner solar system until 2031 and heightened activity is not expected until the late 2020s. For the moment, then, the Leonids will not produce the truly extraordinary displays witnessed in 1833, 1866, 1966 and 2001. Woodcut prints of the Leonid storm of 1833 depict a continuous rain of shooting stars, like sparklers on Bonfire Night. Contemporary accounts talk of perhaps a quarter-million meteors seen over a nine-hour period as seen from North America. While it is likely that a Leonid meteor might be seen, on average, every six minutes near the maximum from a dark sky site, the shower’s radiant in the Sickle of Leo does not attain a useful altitude in the eastern sky until about 11pm local time in the UK. Given that the predicted maximum is close to 1h UT (1am GMT) on 18 November, observers in Western Europe are favoured, particularly after the 9-day-old waxing gibbous Moon sets around the same time. However, for those of you still up for the challenge, try to find a safe place as far removed from light pollution as you can around midnight that offers a clear view of the eastern sky and direct your attention to the sky halfway from horizon to overhead.